With 13,000 floral species and over 15,000 faunal species, three newly discovered big animal species, and a ratio of country/world species of 6.3%, Vietnam has enormous tourism—particularly ecotourism—potential. In fact, since 1986, when Doi Moi (renovation reforms) began the shift from a centrally planned to a socialist-oriented market, or multi-sectoral, economy, tourism has been an sector of primary concern to the government. In May 1995, the prime minister of Vietnam approved a master plan of tourism development for the period 1995-2010. In February 1999, the state decree on tourism was part of the socio-economic development strategy for the period 2001-2010 approved at the IX National Congress of the Party: “Tourism development has become a spearhead economic industry indeed. It is necessary to improve the quality and effectiveness of tourism activities, bringing into full play the natural conditions, and cultural and historical tradition to meet the domestic and international demand for tourism and to catch up with tourism development in the region” (Document of the IX National Congress 2001). Tourism has so far brought great benefits to the economy, but it has also contributed to environmental degradation, especially biodiversity deterioration. Thus, the concept of “sustainable development”—development which meets the needs of the present without compromising the ability of future generations to meet their own needs—must be factored into tourism development. This consideration is reflected in the term “ecotourism,” which is referred to variously as ecological or environmental tourism, nature or green tourism, sustainable or responsible tourism. Ecotourism involves travel to relatively undisturbed natural areas with the specific object of studying, admiring, and enjoying scenery, plants, and animals, as well as any cultural features found in these areas. It is distinguished from mass or resort tourism by its lower impact on the environment, lower infrastructure requirements, and its role in educating tourists about natural environments and cultural values. Fully aware of its significance, the government of Vietnam has prioritized ecotourism in its strategy for tourism development to ensure both sustainability and economic benefits. Though ecotourism in Vietnam is at a beginning stage of development, it is expected to grow strongly through support from government and international organizations. Vietnam is both a “cradle” of native species and a transitional area of organisms from the biota of the north (Himalaya-south China), the south (Malaysia-Indonesia) and the west (India-Myanmar) (Khanh 1999). Moreover, due to its diversity of topography and climatic conditions, Vietnam is rich in floral and faunal species, of which 10 percent and 11 percent, respectively, are endemic. The three big animal species that have been recently discovered in Vietnam are “Sao la” (Pseudoryx nghetinhensis) in 1992, “Mang lon” (Megamuntiacus vuquangensis) in 1993, and “Mang Truong Son” (Muntiacus truongsonensis) in 1996. Indeed, Vietnam is considered one of sixteen countries with the highest biodiversity in a wide range of ecosystems (WCMC 1962)—a very favorable condition for ecotourism development. Coastal ecosystems: Vietnam’s 3260 km of coastline hosts a variety of coastal ecosystems. The number of seagrass species in Vietnam ranks second only to the Philippines within ASEAN. Seagrass beds are increasingly abundant from north to south and are home to 125 benthic species and 158 seaweed species (Tien 2000). Sea cow (Dugong dugong or manatee)—an animal species in danger of extinction—can be found in the Con Dao seagrass bed. Coral reef ecosystems are already attractive to ecotourists, with resorts established at Cat Ba Island, Co To, Bach Long Vi, Con Co, Hon Son Tra-Hai Van, Con Dao, Phu Quoc, and islands in Khanh Hoa province. Divers can observe colorful coral reefs with a wide range of flora and fauna. Coral reef samples are exploited for tourist souvenirs in the provinces of Quang Ninh, Nha Trang, and Con Dao (Tien 2000). Species composition is rich: about 95 species of 35 genera in Northern coastal areas and 255 species of 69 genera in Southern coastal areas. These include 180 phytoplankton, 97 zooplankton, 70 seaweed, 78 polychaeta, 208 mollusk, 76 crustacean, and 157 fish species (Yet 1998, cited in Tuan 2000). The National Environment Agency of the Ministry of Science, Technology and Environment (2000) lists 79 wetland areas of national importance (Hughes et al. (eds.) 2001). Among them are lagoon ecosystems, found only in Central Vietnam (Tam Giang-Cau Hai, Tra O, Truong Giang, O Loan, Thuy Trieu, Thi Nai, and Nuoc Ngot). Lagoons are very high in biodiversity with a high level of nutrition. As one of the biggest lagoons in the world, Tam Giang-Cau Hai Lagoon (21,000 ha) has as many as 55 species of seaweed. Fish, shrimp, and crabs of economic value include Mugil cephalus, Siganus guttatus, Penaeus monodon, Scylla serrata, and Portunus pelagicus. Hundreds of tons of mollusks are harvested annually (Hoi et al. 1995, 1996). Lagoons in Vietnam also contain mineral resources of high value, help regulate the local climate, and can become ideal tourist destinations. Wetland areas of obvious tourist interest are coastal sandy ecosystems. The total area of sandy beaches in Vietnam is 170 km2. According to Mai Sy Tuan (2000), flora found here are not rich in species composition, mainly shrubs and succulent grass such as Pandanus tectorius, Agave americana, Euphorbia antiquorum, Opuntia sp., Sesuvium porlulacastrum, and Casuarina equisetifolia. There is a globe-shaped grass species, Spinifex littoreus, with infruitescence resembling a porcupine, which, when ripe, roll along sandy beaches to the delight of children. On hot sunny days, you can lie on hammocks under the Casuarina equisetifolia forest listening to the wind singing or eat seafood such as squid, blue crabs, mud crabs, and banana shrimps. Other marine species commonly found are uca, mollusks, amphibians, reptiles, and birds. Most notably, this ecosystem provides a breeding ground for some turtle species in danger of extinction. Among the many beautiful sandy beaches in Vietnam are Cat Ba Island, Tra Co, Bai Chay (Quang Ninh Province), Do Son (Hai Phong City), Dong Chau (Thai Binh), Hai Thinh (Nam Dinh Province), Sam Son (Thanh Hoa Province), Cua Lo (Nghe An Province), Thien Cam (Ha Tinh Province), Lang Co (Thua Thien Hue Province), Ngu Hanh Son (Da Nang City), Nha Trang (Khanh Hoa), Phan Thiet (Ninh Thuan), and Vung Tau. 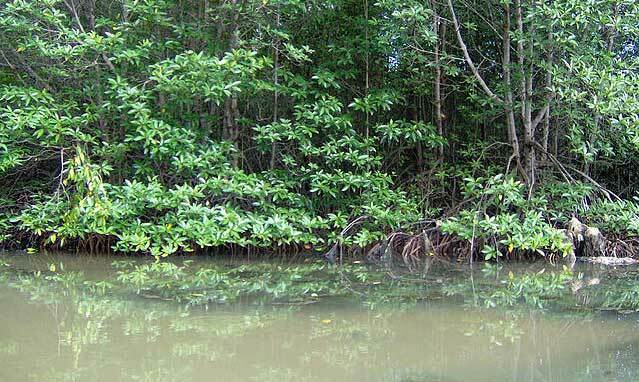 Vietnam’s diversified mangrove forests suffered greatly during the two Indochina wars. In recent years, mangrove reforestation efforts have been made by many groups, ranging from central and local governments to NGOs and other international organizations. A typical example is Can Gio Mangroves (described in the case study below), designated by UNESCO as the first Biosphere Reserve in Vietnam on 21 January 2000 and included in the world network of Biosphere Reserves. Ca Mau mangrove forest in the extreme south features houses of built in traditional Tay Nguyen style and seven other simple Nypa palm (a mangrove species) thatched huts and a small pathway leading to the mangroves. Though infrastructure is still poor, the area attracts 3,000 tourists per month (People’s Newspaper, 11 September 2002). The Xuan Thuy Ramsar Convention Nature Reserve supports a great variety of faunal and floral species, including nine threatened and near-threatened bird species. Most notably, 26 percent of the world’s black-faced spoonbill and 2 percent of the Larus saudersi can be seen here (Birdlife 2001). Limestone ecosystems: Limestone mountains are distributed mostly from the north to Quang Binh. These mountains of evergreen forests have vivid fauna and flora species. They are also home to the distinctive cultures represented by some of Vietnam’s ethnic minorities. Vo Tri Chung (2002) stated that limestone mountains contain many historical vestiges of human civilization, social development, and protection of the country. 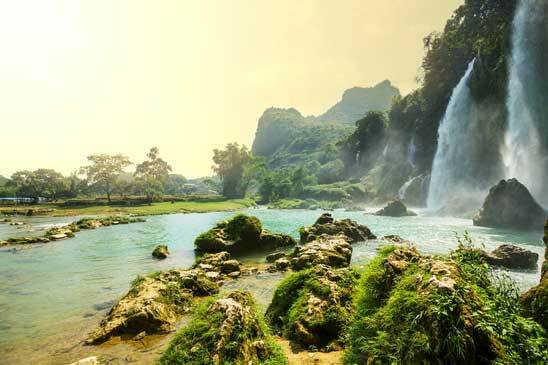 Visitors can hike in limestone mountains in the Cat Ba, Ba Be, and Cuc Phuong National Parks and the Phong Nha-Ke Bang and Paco-Hangkia Nature Reserves. Special use forest system: According to the Tourism Development Research Institute, the special use forest system includes eleven national parks of 259,797 ha; sixty-one nature reserves of 1,692,351 ha; and thirty-four environmental, historical, and cultural forests of 147,886 ha. The total area of special use forests in Vietnam is 3,100,034 ha, accounting for 28.4 percent of total forest land (10,915,592 ha). Some national parks are located in remote areas, such as the Pu Mat and the Ben En national parks; others lie along national roads or near big cities with convenient transportation suitable for ecotourism development. They are Ba Vi national park (Ha Tay province), Cuc Phuong national park (Ninh Binh province), Cat Ba national park (Hai Phong province), Tam Dao national park (Vinh Phuc province), Bach Ma national park (Thua Thien Hue province), and Nam Cat Yien national park (Dong Nai Province). In recent years, the government of Vietnam has invested in improving infrastructure and investigating the floral, faunal, geological, and geomorphological characteristics of national parks. These areas have become research sites for the maintenance of biodiversity samples. Therefore many universities and research institutions have organized visits for students, cadres, and foreigners. We hope the open door policy of sustainable tourism development will continue to channel appropriate investment to national parks in order to welcome nature reseachers to Vietnam. Since 1987, the establishment of special use forests increased thanks to interest from the central to local levels, the cooperation of scientists and researchers, and the coordination and assistance of international organizations and NGOs. It is in these forests that ecotourism should continue to be developed for both their natural and their cultural value. Fruit gardens: Lying in the tropical region, Vietnam has many varieties of fruit trees, especially in the Mekong river delta, where warm weather favors year-round tree growth. After hard-working days in noisy urban areas, visitors can walk in gardens of diversified fruits of many colors and sample the simple, peaceful life closely associated with the river. One newly emerged ecotourist village is My Khanh village, about 10 km from Can Tho City in the southwest. It is a fruit garden located on 40,000 m2 with many canals and creeks, floating markets, traditional (“rong”) style guesthouses, and stocked lakes for fishing and boating. It is a good place for visitors interested in culinary culture, local fruit specialties, traditional production of noodles, wine, young sticky rice, mat weaving, and rice grinding (Sai Gon Economics Time 2002). Vietnam is rich in culture identity, with fifty-four peoples whose indigenous knowledge should also be accessible to visitors. One of the principles of ecotourism is to preserve cultural integrity because human value cannot be separated from natural value. As most potential ecotourist sites are inhabited by ethnic minorities, the principle of “encouraging community participation in ecotourism activities” should both create income and help maintain cultural identity. These communities have a deep understanding of traditional festivals, cultivation and land use customs, culinary culture, traditional lifestyle and handicrafts, and historical places. A trip to the limestone mountain of Cao Bang-Bac Kan, for example, is valuable not only for the natural Ba Be Lake, but for the opportunity to learn about cultivation customs, dying practices using endemic plants to produce brocading (Cham weaving), and traditional handmade boats of precious timber collected in the forest. Cultural value is also represented in Vietnam’s approximately 100 traditional festivals. The Nghinh Ong Festival—to worship “Whale”—is the biggest festival of coastal fishermen in Vietnam (Canh 2002). Other distinctive celebrations are the “Spring” festival of Thai and Muong ethnic minorities and elephant racing and buffalo festivals in Tay Nguyen. According to Nguyen Van De (2002), there was a 7.1-fold increase in international tourist visits from 300,000 in 1991 to 2.14 million in 2000; domestic tourism experienced a 7.5 fold rise, from 1.5 million to 11.3 million visits. This is a high rate of increase compared to other countries in the region, bringing international tourism in Vietnam to a near equal level with the Philippines and to about one quarter of that of Malaysia, Singapore, and Thailand. Those referred to as ecotourists account for over 30% of international and nearly 50% of domestic tourists (Luong 1999). Tam Dao National Park receives 120,000-150,000 visitors every year (Tien 2002). Tourism in Nam Cat Tien is restricted, but still some thousands of mostly young people visit this area. Meanwhile, ecotourists to Ha Long Bay number 400,000. Ecotourism has been increasing in recent years, with domestic visitors rising more rapidly than international ones, accounting for up to 9.5 million people in 1998 (Luong 2000). Most ecotourists are adventurous young people and researchers who focus on national parks and nature reserves. Because ecotourism is important for environmental education, maintenance of indigenous culture, and local economic development, both investment and government encouragement are required. Fillion et al. (1992, cited in Ceballos-Lascurain 1996, cited in Le Van Lanh 1999) estimated that international ecotourism generated USD 93-233 billion in 1988, and in fact, most nature reserves in the world are dependent on ecotourism revenues. But ecotourism also needs investment in human resources (especially tourist guides), management, and fundamental research and planning focused on the natural environment of proposed ecotourism sites. Investors at home and abroad have preferred to focus on infrastructure like hotels and restaurants. What investment does exist goes mainly to national parks and nature reserves and comes from the state budget through the Ministry of Agriculture and Rural Development and from international organizations like WWF and the governments of the Netherlands, Hong Kong, and Singapore. Total capital investment in national parks and nature reserves from 1994 to 1999 was VND 71.1 billion (USD 1.1 million today). According to the Institute of Tourism Research and Development’s 1999 investigation, visitor entrance fees generated VND 386.2 (USD 25,150) million for reinvestment in infrastructure, conservation, and forestry development (Luong 2000). Poor and uncoordinated management and organization of ecotourism have limited the development of this sector. Most resorts—beaches and other popular sites—are under the management of provincial tourism departments. In nature reserves and national parks, there is coordination between management boards and tourism corporations, which make investments in infrastructure and enjoy partial profits collected from fees. But there are often too many overlapping jurisdictions. For example, special use forests are managed by the forestry sector. The management boards of National Parks are under the Ministry of Agriculture and Rural Development; those of Nature Reserves and Cultural, Historical and Environmental Forests are under Provincial and City People’s Committees. In Con Dao National Park, the local units involved in tourism are the district government, Con Dao National Park, tourism managers, military units, and local fishermen. According to new regulations governing the management of special use forests promulgated according to Decision No. 08/2001/QD-TTg by the prime minister (November 11, 2001), the Ministry of Culture and Information in coordination with the Ministry of Agriculture and Rural Development is responsible for establishing and managing Cultural, Historical and Environmental Forests. This tangled web of oversight has yielded no national strategy for ecotourism in Vietnam. And although tourist routes have been set up, no zoning plans have clearly delineated areas for ecotourism activites in national parks and nature reserves. Vietnam’s natural and cultural potential for ecotourism is well established. However, based on the following principles of ecotourism (Luong 1999), the economic activity occurring in Vietnam is only a type of nature-based tourism. Principle 1: “Educating tourists on the natural environment to raise their awareness and get them involved in conservation work.” Who is responsible for environmental education? The tourist guides, managers, and other ecotourism staff. But in fact, most of these people do not have sufficient environmental training or indigenous knowledge to engage in education work. Research by Pham Trung Luong (2000) shows that 90 percent of ecotourist guides lack environmental knowledge (80 percent about flora and fauna species, 80 percent about natural resources typical in their area), and 88 percent would benefit from ecotourism guidebooks written especially for them. An illustration of wasted potential caused by this lack of training is Ha Long Bay, a world heritage site with immense environmental value—coral reefs, limestone mountains, thousands of flora and fauna species of high biodiversity—and rich cultural identity. But tourists in Ha Long Bay are presently visiting only the Bay and some caves, not accessing environmental information or local cultural activities. In general, the full potential of ecotourism has not yet been reached. Principle 2: “Protecting the environment and maintaining vulnerable ecosystems.” Ecotourism should be associated with sustainable development, human love for nature, and protection of the environment. Nevertheless, much tourism is still spontaneous and lacking in management and visitor regulations. Some tourists are not fully aware of environmental protection and reluctant to pay conservation fees. If they throw rubbish or cut tree branches, they are not fined. As a result, some tourist areas have suffered serious environmental degradation, such as Huong Pagoda (Ha Tay province). And since there have been few Environmental Impact Assessments, the consequences of ecotourist activities are not clearly understood. Principles 3 and 4: “Maintaining and promoting cultural identity and involving local communities in ecotourism.” International vistors to Vietnam often like to visit ethnic minority villages to observe the culture, meet local people, and participate in traditional activities. The ethnic minorities who live in or near nature reserves maintain distinctive lifestyles, cultural identities, and traditional customs. These features are part of the real value of ecotourism. However, local people are not much involved in ecotourism, and most tourist guides have poor knowledge of the indigenous culture. Therefore, ecotourists get no exposure to Vietnam’s diverse cultural identities. This is a limitation that must be overcome. In addition, local people still live in poverty, their life closely associated with natural resources. The economic benefits of ecotourism need to be shared with them, but this will not happen without community participation. China provides a positive example: a questionnaire survey by Dr. Li Wenjun (2002) showed that most residents in Jiuzhaigou Biosphere Reserve, China, have been involved in the tourist business and its relevant jobs. Participation includes operating a family hotel, restaurant, or gift shop; renting yaks, sheep, and traditional ethnic dress to visitors for photographs; working for hotels, restaurants, or tour companies; and collecting garbage in tourist areas. The family hotel business is the main income source for residents. Can Gio Mangrove Biosphere Reserve (CGMBR) is a rehabilitated mangrove area located within Can Gio district in the Southeast. It covers 73,000 ha including nearly 40,000 ha of mangroves. This area was largely destroyed during the war, particularly in the period 1962-1970. Restoration was begun in 1978 by the government of Ho Chi Minh City with labor provided by local people and city organizations. It became a biosphere reserve recognized by MAB/UNESCO in 2000. Located only 40 km from downtown Ho Chi Minh City, with the great diversity of fauna and flora typical of tropical mangrove ecosystems, and with great historical and cultural traditions, Can Gio is becoming a favorite recreation/tourism destination for residents of the Ho Chi Minh City area. Natural and social background: Can Gio is uniquely valuable for its diversity—72 mangrove plant species, including 30 true and 42 associate mangrove species belonging to 10 main plant communities occupying newly formed mudflats along rivers, firm mudflats flooded by spring tides, highland sandy clay, abandoned salt pans, and brackish water areas. Some of the mangrove are rare species listed in the Vietnam Red Book, such as Lumnizera littorea and Aegiceras florida (Tuan et al. 2002). The 440 fauna species (Hong et al. 1996; Nhuong 2000, cited in Tri et al. 2000:14-15) include 118 invertebrate macro benthic, 134 fish, 9 amphibian, 30 reptile, 130 bird, and 19 mammal species (Hong et al. 2000). All of these are located in a complex and beautiful network of natural rivers and canals. Can Gio also has a remarkable history. Archaeological evidence indicates that a relatively developed socio-economic life existed in this area in the first millennium BCE related to offshore shipping and trade with other regions. During the war years (1968-1975), this area was well known as a resistance base; the Special Water Task Force was responsible for famous victories costing the enemy great losses in war equipment and soldiers on Long Tau river. The fishing community in Can Gio also has a yearly festival to welcome the “king-fish,” a day of reunion for all local people. Tourism in Can Gio: Recreational visits to Can Gio started spontaneously in the mid-1990s as students from the city came to visit the beach and see monkeys on the weekends. There were neither entrance fees nor services. In 2000, a new bridge was completed across the Dan Xay river, facilitating transport from Ho Chi Minh City to Can Gio town, and the Forest Park was handed over to Sai Gon tourist company. Since then, tourism in the area has been highly promoted to city residents. There are three main tourist features in Can Gio. The Forest Park is home to a mischievous 600-member natural monkey troupe, a semi-natural crocodile pool, a historical museum, and a newly restored model of a Vietnamese army base. Visitors enjoy walking under the cool mangrove canopy and playing with the monkeys or sitting in the former army base recalling battles against enemies. Food and drink are available in the park-owned restaurant. The Vam Sat site includes a bat sanctuary in the flooded Rhizophora area and a bird sanctuary containing over 10 species listed in the Red Book. Here visitors and scientists can find a diverse three-level fauna system: birds at the top, mammals in the middle, and aquatic organisms, including sea and brackish water species, at the lower level. A 58m observation tower helps visitors enjoy the whole scene. The April 30th Beach is located in the transition zone near Can Gio town. Although the long beach is not of high quality, it is near the city and features cheap local seafood, which can be enjoyed under the canopy of a nice stretch of casuarina trees. In the town itself, people can visit the mausoleum/tomb of General-Fish, a respectable traditional character of the Can Gio fishing community. Tourism in Can Gio is in the process of transformation from a spontaneous to a professional format. Visitors are mainly residents of Ho Chi Minh City seeking relaxation, fresh air, and a natural environment as a respite from work in the busy city. Most go to the Forest Park and the beach, the numbers rising quickly from 27,213 in 1997 (Sinh 1999) to almost 230,000 in 2001. It is estimated that around 80 percent come from Ho Chi Minh City, 5 percent from the local area, 1 percent from abroad, and the remainder from other nearby provinces. As at many other nature-tourist sites in Vietnam, educational activities are limited. Vam Sat provides visitors with basic knowledge of the ecosystem of mangrove fauna and flora, and has therefore attracted a good number of scientists and true eco-tourists. But this site has not attracted a lot of casual visitors because its lack of large car parks and long travel time by boat makes its travel cost relatively higher than the other Can Gio sites. Can Gio district, together with city’s Department of Tourism, is planning to increase tourist sites in Can Gio in both quantity and area to make tourism the leading economic sector of the district and a strong point of the city. Tentative additions include ecological training tours, a picnic site for the city’s young people, the Sac Forest naval site, orchards, and historical sites (Department of Tourism 2002). Management of tourism in Can Gio: The management of tourism in Can Gio is rather complex, involving both public and private parties. Two big tourist companies based in Ho Chi Minh City operate in the area—the Sai Gon Tourist Cooperation (SGT) and Phu Tho Tourist. The district’s trading company and some private enterprises operate restaurants, guest houses, and private car parks. At least 100 local families operate seafood shops, souvenir shops, drinks stands, and chair rentals. Businesses related to transportation along the main road from Ho Chi Minh City—motorcycles, buses, the ferry, and shops—also benefit from tourism development. The management board for Can Gio protected mangrove forests, some forestry plantations, and the district’s organisations in Can Gio are planning tourist businesses of various types. And the newly established management board for April 30th Beach (under the district People’s Committee) controls the operation of shops and security there. The impact of tourism: At the moment and in general, the impact of tourism on the local economy and society is positive. Some local community members have seen their income increase and their living standards improve through employment in beach services, in businesses along the main road, or in the big tourist companies. The most visible and general benefit to the local community is improvement in the local infrastructure. The new bridge, good roads, and electricity which support tourism also improve the life of local people. But eco-tourism in Can Gio is also having some negative impact on the environment and the community. With the number of visitors increasingly rapidly, beach pollution is becoming a problem. Waste is collected each morning; for the rest of the day, refuse from food and drink shops are thrown into the beach creating unhygienic conditions. The operation of shops and services by local people who lack knowledge of tourism and business practices has led to unfair competition among the food sellers and chair renters and to social evils such as fighting. To make this sector socially healthy and sustainable, local people involved in tourism and tourist company employees should be reorganized and given training in sustainable eco-tourism. A good management board should also be established to control the activities of all stakeholders and ensure their activities do not go beyond the permitted level. Concerned bodies from the local to the central levels should coordinate planning, ecotourism policy-making, the compilation of guidebooks, and the conservation of vulnerable ecosystems, wild life, and cultural integrity. Baseline studies of the natural environment of potential ecotourism areas should be carried out. These include Environmental Impact Assessments of ecotourism activities and research into carrying capacity to avoid overconcentration of tourists, too many hotels, and a level of noise and transportation that would seriously affect local life and natural environments. Ecotourist guides should undergo compulsory training at colleges or universities. Staff, especially managers, should be equipped with professional skills and basic knowledge of ecotourist practices at home and abroad. Local communities should be engaged in ecotourism—not only in generating greater income, but also in conservation work. This may require the development of special schemes. Phan Nguyen Hong, Quan Thi Quynh Dao and Le Kim Thoa work at the Mangrove Ecosystem Research Division, Centre for Natural Resources and Environmental Studies, Vietnam National University, Hanoi. The case study presented in this paper is an initial finding from the project funded by the MAB/UNESCO within the Young MAB Scientist Award Programme 2002, and was undertaken with Le Kim Thoa. The author would like to express great gratitude to MAB/UNESCO for this support. Canh, Vu Tuan. 2002. Sustainable development of sea tourism: present status and solutions (in Vietnamese). In Proceedings of the Symposium on Environmental Protection and Sustainable Exploitation of Natural Resources, held in Hanoi, 4-5 August 2002. Hanoi: Agricultural Publishing House. Chung, Vo Tri. 2002. Ecotourism in limestone mountains. In Sustainable Development and Protection of the Forest and Biodiversity on Limestone Muntains of Vietnam. Hanoi: Forest Inventory and Planning Institute. De, Nguyen Van. 2002. Tourism of Vietnam in progress (in Vietnamese). In Proceedings of the Symposium on Environmental Protection and Sustainable Exploitation of Natural Resources, held in Hanoi, 4-5 August 2002. Hanoi: Agricultural Publishing House. Department of Tourism, People’s Committee of Ho Chi Minh City. 2000. Project on the planning of Can Gio eco-tourism (in Vietnamese). Unpublished. Document of the IX National Congress (in Vietnamese). 2001. Hanoi: National Politics Publishing House. Hoi, Nguyen Chu et al. 1995. Report of the project KT-03-11 (in Vietnamese). Archive at Hai Phong Institute of Oceanology. Hoi, Nguyen Chu et al. 1996. Summing up report of the project KT-DL-95-09: Study for rational exploitation and utilization of Tam Giang Lagoon (in Vietnamese). Archive at Hai Phong Institute of Oceanology. Hong, Phan Nguyen, Nguyen Hoang Tri, and Le Van Sinh. 2000. Potential for eco-tourism in Can Gio Mangrove Biosphere Reserve. Paper presented in the Ecotone IX Seminar, Wise Practices in Coastal Tourism Development in Protected Areas, held at the Puerto Galera Biosphere Reserve, The Philippines, 21-27 May 2000. Hughes, R., Le Trong Trai, Andrew W. Tordoff, and Vu Van Dung, eds. 2001. Information on Proposed and Existing Protected Areas in Vietnam (in Vietnamese). Volume I: Northern Vietnam. Program of Birdlife International and Forest Inventory and Planning Institute. Khanh, Nguyen Ngoc. 1999. Characteristics of ecosystems: A basis for ecotourism development in Vietnam (in Vietnamese). Paper presented at the workshop Building a National Strategy for Ecotourism Development in Vietnam, held in Hanoi, 7-9 September 1999. Democratic Republic of Vietnam. 1998. Land Use Law, December 1998 Amendments and Supplement to the 1993 Land Law (in Vietnamese). Hanoi. Lanh, Le Van 1999. Ecotourism in protected areas of Vietnam: Potential, present status, solutions and strategies for development (in Vietnamese). Paper presented at the workshop, Building a National Strategy for Ecotourism Development in Vietnam, held in Hanoi, 7-9 September 1999. Luong, Pham Trung. 1999. 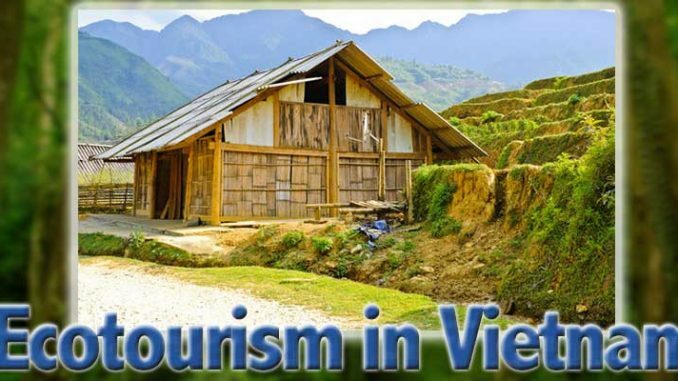 Present status, potential and orientation for ecotourism development in Vietnam (in Vietnamese). Paper presented at the workshop, Building a National Strategy for Ecotourism Development in Vietnam, held in Hanoi, 7-9 September 1999. Luong, Pham Trung. 2000. Report of the Project, Study on the Principles of Sustainable Use of Biodiversity Resources Based on Ecological Approach, of the Tourism Development Research Institute (in Vietnamese). Hanoi: Tourism Development Research Institute. People’s Newspaper (in Vietnamese). 11 September 2002. Sai Gon Economics Time (in Vietnamese). 15 August 2002. Sinh, Le Van. 2000. Ecotourism in Can Gio-Ho Chi Minh City: Current status and solution for further development. Proceedings of the Scientific Workshop on Management and Sustainable Use of Natural Resources and Environment in Coastal Wetlands Organised by the Centre for Natural Resources and Environmental Studies. Hanoi: Agricultural Publishing House. Tien, Nguyen Van. 2000. The role of sea-grass, coral reef and lagoons in management of coastal areas (in Vietnamese). Proceedings of the Training Course, Planning Sustainable Development in Coastal Areas, held at Ninh Binh Town, 23-28 February 2000. Tien, Do Dinh. 2002. Tam Dao National Park (in Vietnamese). In Proceedings of the Symposium on Environmental Protection and Sustainable Exploitation of Natural Resources, held in Hanoi, 4-5 August 2002. Hanoi: Agricultural Publishing House. Tri, Nguyen Hoang, Phan Nguyen Hong, and Le Trong Cuc. 2000. Can Gio Mangrove Biosphere Reserves. Hanoi: Cartographic Publishing House. Tuan, Le Duc, T.T.K. Oanh, C.V. Thanh, and N.D. Quy. 2002. Can Gio Mangrove Biosphere Reserves. Hanoi: Agricultural Publishing House. Tuan, Mai Sy. 2000. Coastal typical ecosystems (in Vietnamese). In Proceedings of the Training Course, Planning Sustainable Development in Coastal Areas, held at Ninh Binh Town, 23-28 February 2000. World Conservation Monitoring Centre. 1992. Global Biodiversity: Status of the Earth’s Lving Rsources, ed. Brian Groombridge. London: Chapman and Hall. Wenjun, Li, 2002. Community participation in ecotourism in China’s Nature Reserves: A case study in Jiuzhaigou Biosphere Reserve. In Proceedings of the UNESCO-MAB Regional Seminar Ecotone X – Ecosystem Valuation – for Assessing Functions, Goods and Services of Coastal Ecosystems in Southeast Asia & SeaBRnet Meeting for Coastal Biosphere Reserves Cooperation, held in Hanoi, 19-23 November 2001.